I recently realized I don't post a lot of my graphic design work. So here's a label design created quite awhile ago. This is a personal favorite. If you're into design/ illustration as a profession you know it's very rare that a client give you free reign to design whatever you want, however you want. This wasn't such a case. My only instructions were to come up with a name and design for a breading line. That's it. 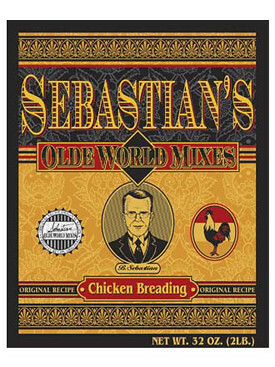 So I came up with the Sebastian's name for the brand, a line art drawing of the company's owner and a sophisticated turn of the century design. I chose a turn of the century look and feel for the design beacause he was potentially competing with more established brands. So I thought it would be interesting to pre-date all of those and give the apperance that Sebastians's had been around a long time. Although the product hasn't been manufactured yet it was a great project to work on. You Killa My Dog... I Shoota You Face!